Gifts are fantastic… but tricky! They have provided me with a life-time of enjoyment morphing from the raw excitement of opening gifts as a little kid to the unmatched satisfaction of giving the perfect gift that lights someone up. Now if I could package the feeling that I had that day watching the water crashing over the rocks – that would be an amazing gift. Malls understand this well. That is why they have ensured ready access to the pity bench near the stores. Inevitably it will be occupied by a forlorn-looking guy suffering from culture shock as enthusiastic shoppers stream by him. Time. Stands. Still. For anyone who has ever sat on the pity bench, or wished they could, here is a list of entirely unhelpful shopping and gifting observations … just so you know that not everything out there makes sense. 1. Crafty gifter. These are the people who give hand-crafted gifts making it impossible to match. They are quick to suggest that everyone should bring a gift of something they made – the non-crafty people’s eyes immediately widen in horror. 2. Merry Christmas to me. In the exuberance of shopping and buying gifts, somehow most of the packages seem to be for them at the end of the day. How did that happen? Back to the drawing board with more shopping! 3. Careless gift giver. This shopper loads up on clothes for everyone. Oh and if it doesn’t fit you can take it all back. In the end it isn’t giving a gift as much as gifting a shopping errand! 4. Idealist shoppers. My friend’s standard for gifts might make the most skilled gifting pros a little uneasy. He likes to give gifts that people didn’t know that they wanted but can’t live without once they have it. Yikes. 5. Keeping-up-with-the-Jones’ shoppers. They are the ones who keep ramping up the value of gifts every year for fear of being out gifted. This is love if you like accounting and guilt. 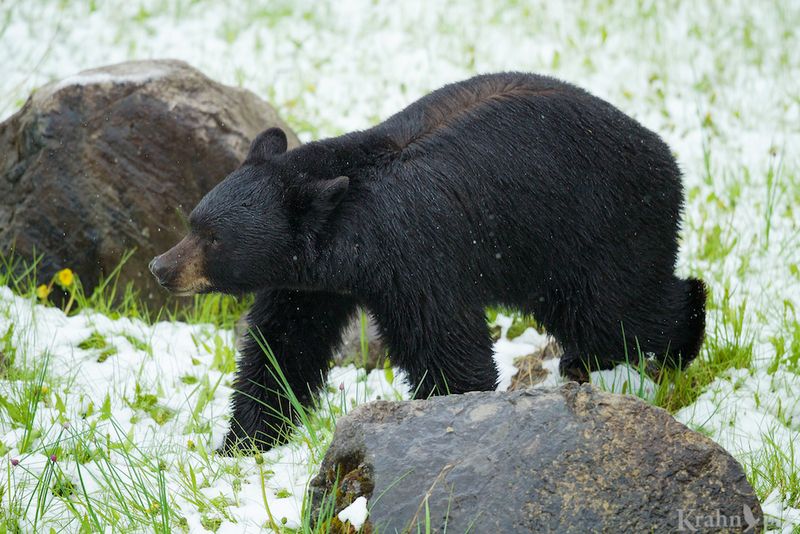 No Christmas post is complete without a gratuitous black bear photo. 6. List shoppers. Sometime in summer they start demanding lists from family members with the persistence of a collection agency. Then they religiously follow the script and surprise no one with their ingenuity. 7. Procrastinators. They are too easy to pick on. The full realization of the looming deadline is just starting to kick in. Why did Christmas come so early this year? But no worries, there’s still lots of time. 8. Money exchangers. Why shop when you can send money or gift cards? My favourite true story is two couples exchanging presents that turned out to be gift cards – two gift cards… from each couple… from the same two stores… for the same amounts. 10. Shopping gift givers. This year my son reminded me that giving Christmas gifts may be a less generous gesture than we think. Why? The gifts come with expectations. In our culture, our gifts often end up as a form of economic exchange where something inevitably is coming back to us. Taken to its logical extreme, if gifts are really disguised obligations, we should be giving gifts to those who annoy us so they have to do more shopping! Maybe the best Christmas gifts are the ones we give without any expectation of something in return. It’s something to think about. Krahnpix note: I will be taking a break from posting blogs and checking in on other blogs until after Christmas. I would still love to hear your reaction to this post and will enjoy responding to every comment. Every year we swear we’re not going to exchange gifts, and every year we fail miserably. Now that my daughter has married someone whose family lives for Christmas, and who himself loves buying presents, I’m officially giving up on the gift-free Christmas crusade. I do knit, however, and can always play the Crafty Gifter card if need be. Awesome. That bench can get pretty crowded. As long as it’s a short trip it will be great! Thanks for your thotful wishes and I hope you have the same in a great new year. Thank you, Lyle. Hope you’re enjoying all the blessings of the Christmas season. I hope you had a great Christmas. It is a wonderful season of celebration. I hope you have a great Christmas as well. I think I do too which is probably where that came from. I’ve always thot truth was more humorous than fiction anyway. Made me chuckle. And everyone a truth. Happy Holidays to you. Glad to get a chuckle! Thanks for the comments and I hope you have a great Christmas. You are obviously as keen an observer of human behavior, Lyle, as you are of animal (and bird) behavior–your observations are right on target. I like your suggestion about giving without expectations of reciprocity and find a lot of wisdom there. I am in awe of your black bear shot. You captured a whole lot of personality in its wonderful expression. Have a very Merry Christmas, Lyle. Observing any behaviour can be a rewarding and amusing endeavour since there are so many ways to look at things. My son has caused me to look at gift giving from a different perspective – I’m glad it resonated with you. I was able to follow that black bear for awhile and was pleased to get a composition that showed off the contrast with the snow and some expression. It was a fun day. You have a great Christmas as well. Truly enjoyed this post – Merry Christmas, enjoy your time off. Happy to hear you enjoyed it. You have a great Christmas as well. Enjoy your break from posting. I look forward to your return and more pictures of Black Bears. Thanks. I still have a few bears left in the hopper and they definitely need to come out. Have a great Christmas. So glad you included the gratuitous bear shot! Have a wonderful Christmas and time off. That might not be a bad idea! It’s been far too long since I posted a bear so it was just a matter of finding the right one. I quite like this one. It has been a bit of a struggle lately to motivate myself to write posts so I’m hoping a break helps. I wish you a wonderful Christmas as well. I think bear has already had his/her Christmas gift, by the smile on his/her face! As for me, I’m the kinda shopper who knows exactly the kinda gift you need and you are always grateful to receive….!!! True! 😀 Enjoy your Christmas break…. Ah the perfect shopper! And if you had got the bear something it would most definitely would have been food to keep that smile on its face! Thanks for the comments – have a great Christmas. I have spent plenty of time on the pity bench. Funny I never saw you there. Have a happy and safe holiday Lyle. We have often said at our house that there is only appropriate response to a gift – thank you. It consistently works well. Have a great Christmas. Love the Christmas bear! I am one of those shoppers who starts in September. I don’t rush to finish at all – I graze slowly, hoping something unique will cross my path for each person. Then two weeks before Christmas I text my sister for help finishing off the list. Sometimes my approach yields sweet results, sometimes I get confused looks – either way is OK with me. Maybe I can start a new Christmas bear tradition – it might make as much sense as some of the other ones:) Your approach to shopping sounds utopian! Grazing sounds like such a relaxed and comfortable way to do it. The only grazing I do involves large amounts of food. I like that kind of grazing too. I always end up rushing on a couple of items though. Glad I’m done! There is a satisfaction in finishing. Thank you and the same to you and yours. You may want to get some pictures of snow so you get a sense of a “real” Christmas. Thanks so much – have a great Christmas. Nice Christmas Bear. I try as much as I can to be a number four…. But sometimes miss the mark and end up shopping in “cursive” so to speak. You and your family have a great Christmas, and enjoy your break. I’m pleased you see Christmas in the bear as well – it must be the snow (while overlooking the dandelions). That number 4 is a tough mark to hit consistently! Wishing all of you the best Christmas and solid 4s. And all the same to you as well. If you go with #2, the recipient is generally pleased with the result! Thanks for the comments – have a great Christmas. Ah yes the regifting ritual. I should have added that one, especially the awkward part. It sounds like you’ve had quite a successful run at regifting. I have have a great Christmas. I was hoping someone would like my friendly black bear. Thanks so much for your comments. I hear the airports are a fantastic place to get done. Good luck with that. Have a great Christmas. Your post can only come from someone who has experienced each category, as they are so true – each so very true. Have (or hope you had) a great Christmas! I think I have experienced most of them on one end or the other! I hope your Christmas on the other side of the ocean is wonderful.